I have a data set of 17 samples with FPKM values. In the data set I have ~800 differentially expressed genes some of which have zero FPKM value. I would like to ask you about generating heatmap. Can I use FPKM values directly for generating heatmap? Do I have to perform additional analysis with FPKM values prior to generating heatmap? According to your experience, which genes (based on FPKM values) should I use in heatmap analysis? zFPKM package will be used to convert your FPKM values to the Z-scale prior to clustering. what is the DiffExpressedGenes) ? some genes have 0 (zero) FPKM values in some samples. Is it okay to remove those genes? DiffExpressedGenes is a vector that contains the names of your differentially expressed genes. These names should all be part of the rownames of your FPKM matrix. I believe you can include FPKM values that are 0. Why? - due to the fact that we scale / transform the data to the Z-scale, these values will return as -4 or -6 (or something else that is negative). You cannot have any NAs in your data, but zeros are okay. It should contain genes as rows and samples as columns. The values should be numerical. Most likely, your filtering of differentially expressed genes has been incorrect. What are the contents of DiffExpressedGenes and how did you obtain these? I printed the first column that has gene names using awk command. Do you mean that the DiffExpressedGenes must have only gene names and the MyFPKMValues must have both gene names in each sample with FPKM values? If yes, my files are so. Yes, that should be the situation. I am worried about the '.1' at the end of your gene names in DiffExpressedGenes, though. Are these names exactly as they appear in the rownames for MyFPKMValues? Yes, they are. I picked gene names from the MyFPKMValues. Wait, DiffExpressedGenes looks like a data-frame. Zero values have caused this error?How to deal with this error? I would like to have your advice. In my FPKM data I have ~800 genes. These genes are effector genes (composed of three different gene families) and have FPKM values in each stage. 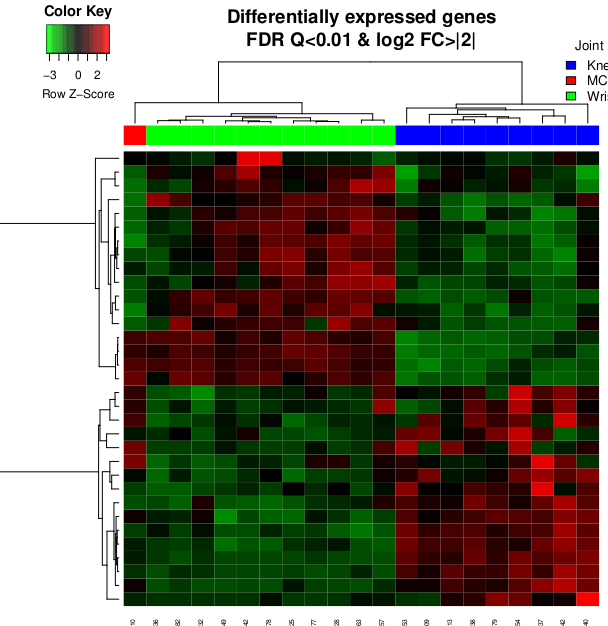 To decrease number of genes to make heatmap more visible, what should I do? You mentioned to use FDR or log2 values, but I just have FPKM values. Is it okay to remove some genes that are under a threshold like 100 FPKM? by the way, Thank you very much for your help at both PCA and heatmap post. From where did you obtain these FPKM values? Do you want to conduct differential expression analysis on them? You could remove low FPKM genes - sure. You could also remove genes that have low variance (probably better). The final line of code (which(geneVariances<cutoffVariance)) should return the indices of the genes that fall in the lower half of variance in your dataset. I generated from cuffnorm tool. You can try CuffDiff to obtain a P value (if you even have samples that you want to compare via differential expression?). The which() command will just return indices of genes, which you an use to filter. Also be aware that Cufflinks is not supported anymore. You should aim to use HISAT2/StringTie the next time. I want to ask one more thing. How to show sample names in heatmap based on orders in FPKM data? when I draw heatmap, sample order has changed. How can I keep the same order with the original file? Hi Mehmet, wait, is this for ComplexHeatmap (from our other thread: how to cluster genes in heatmap ) or heatmap.2 (gplots)? For ComplexHeatmap, just supply row_order or column_order as extra parameters to the Heatmap() function. These just have to be vectors of rownames or column names (that match your data matrix). ComplexHeatmap will then fix the order based on these. For heatmap.2, you can maintain order as per your data-matrix by configuring RowV and ColV, e.g., RowV=FALSE, ColV=TRUE, will cluster your columns but the rows (genes) will be ordered as they appear in your supplied data-matrix. I tried but I could not do. 2. saved the table as "samplenames" 3. I added row_names = "samplenames" in heatmap function. The order on the right side of the heatmap is the correct order based on my data.matrix. samplenames should not be a data-frame, even if it's a single column data-frame. I did but column names below the heatmap did not ordered as they are in the data.matrix. The annotation side is ordered as they are in the data.matrix. I did, but it did not worked. Oh, you have cluster_columns mentioned twice. The first mention of it, it's TRUE, and the second it's FALSE. Take a closer look at your code for the Heatmap function. You'll see it there twice. I know I am asking too much help from you. I really appreciate for your help. It produced a graph with same order in matrix.data, except annotations, but a sample was NA. Can you paste a sample of your data? I am trying to make the data understandable, but I do not know how to do. You may want to post a new question if you still have problems. For clustering, a data-matrix with no NA values must be used. Also, for the distance metrics to function properly, too many zero values will cause problems. the zFPKM link (https://bioconductor.org/packages/release/bioc/html/zFPKM.html) is down. Hey, it seems to be okay for me. Are you getting the 404 error? Can PAM50 classification performed on TCGA-BRCA RNASeq RSEM data be used with RNASeq FPKM normalized data for downstream analysis?